Get off my turf! Only humans are not the ones who shouts this. In jungle also various species are found marking their territories and doing their best to fought the intruders. If you have marked, the street dogs also mark their territories by urinating at lamp posts, vehicle tyres and more. The segmentation of area, the feelings of its possession and will to defend it, all are implanted into behavioral psychology since various species got a little brain. Why we are talking this as of now? 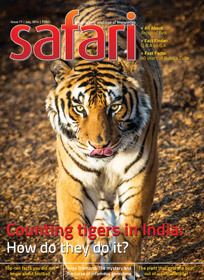 Well, the cover page of Safari June issue have mentioned the same and we expect an article about the same inside. So let us start digging into. The Megapixel contains a classic photo of Venus Transit 2012. Kashmir is considered as heaven on the earth. Various Bollywood films of early 70s made it even popular by representing its beauties to the audience. When British ruled India, they have also found the place vary fascinating of course. To prevent them to grab the area there, the king of Kashmir announced that only the native Kashmiri can bought land there. And then came the Boat House in existence, as it needs no land. A floating home on the water. And Kashmir have the Dal Lake, the bigger and beautiful lake, where later even floating markets came to existence. The Dal Lake is no more beautiful as much it was. The reason is the continuous flow of drainage and dumping of various kind of materials by the residents and tourists. The biggest attraction for tourist, Dal Lake was around 75 square kilometers some years ago, now it shrunk to 11.5 square kilometers, this tells all. Read an eye opener article about the current situation of Dal Lake and quality of its water in the magazine. The small half page article about the Amondawa Tribes, which lives in the Amazon rainforests of Brazil, seems interesting from the title. Though the content is not as good as expected. It could have been better written. The main article which was mentioned on the cover page spread around 6 pages and it gives interesting information about how animals defend their territory against intruders. The embedded pictures adds value to the article. We may know some stuff about the animals, but the article covers the existence of the sense of territory in birds also. It also refers Eliot Howard and his acclaimed book, Territory in bird life. It would be interesting to know that in addition to use of natural perfumes 🙂 by various animals, some uses sound to declare their territory (and its not only lion or tiger’s roar we are talking about). Here is the small fact table from the article which summarizes how much space is needed by whom. Gender transformation is of course an interesting topic and when discussing the same, people usually associate human rights with the same. Even the controversial cases are found regarding several competitions that a person belong to the different gender participated or won the contest by appearing as a person belongs to the wrong gender. But, do you know that, there are some creatures who transform from male to females during their life naturally!? There is an article titled “From Mr. to Mrs.” which discusses about a few such strange examples, when some creatures change their gender. The more interesting stuff is, all this is done by the nature so the creatures can carry forward their generations! Well, you need to read it (and see the photos) to believe it. Our universe in around 15 billion year old. So when reading the major incident happens it is difficult track the stuff (if you are not a scholar in the subject / or deeply interested in the same). How if we associate those events in a calendar, like we do for our regular stuffs!? The idea is good but the timeline is bigger right? Consider the example of a map, where we are showing remarkably large distances on a small piece of canvas, can we try the same for the timeline? Yes, of course. There is an article about Carl Sagan and his Cosmic Calendar. Actually he wrote a book named “The Dragons of Eden” which is best seller. He squeezed the major event took places in the past 15 billion years into a chronological time-scale of one year. A 7 page article about this interesting book by Harshal Pushkarna is a good read. Want to get more quick facts about the same? Read the fast facts segment of the magazine. There is a literally “hot” debate over the topic that what is the hottest chilli of the world. A detailed article about the same is worth a read. There are embedded photos and illustration, details for your fact file and more. If you think it is just a subject for the chilli vendors or food experts, read it and you may change your thoughts. Will a car give more power and deliver more kilometers per liter if it is fed premium fuel? It is said that a calorie is not always a calorie. How come? When is a country, though proclaiming itself as such, not a country? On what basis has blood been classified into various groups? How does a cluster bomb differ from a conventional bomb? Why is Jupiter’s moon Europa believed to have primitive life beneath its frozen surface? How does an icebreaker ship manage to break the ice sheet, whereas the ‘unsinkable’ Titanic was hammered to death by an iceberg? Which was the first country to introduce paper currency? Why do birds migrate, given the fact that on long and arduous journeys they have to expend much energy and encounter great dangers? Why do we experience rich and refreshing earthy smell after a rainfall? The Super Quiz section brings us the information about “Presidents Of India”. And the last cover page brings the details about Lightning. In the season of monsoon, its worth read. What is good thing about this issue is, rather than providing small articles on various topics, it came with detailed articles on comparatively less topic. This way, the articles were able to provide interesting in-depth stuff to satisfy reader’s curiosity about the topic. Overall it is best value for money and one should go for it. Next: Yahoo Server Hacked? How To Know If You Are Affected?